In a small bowl, toss the garlic cloves with 2 tablespoons of the olive oil and some salt. Wrap the garlic cloves in tinfoil and place on the tray in the center of the oven. Cook until tender when pierced with the tip of a knife, 20 to 25 minutes. In a medium bowl, whisk together the balsamic with 3/4 cup of the olive oil and the mustard. 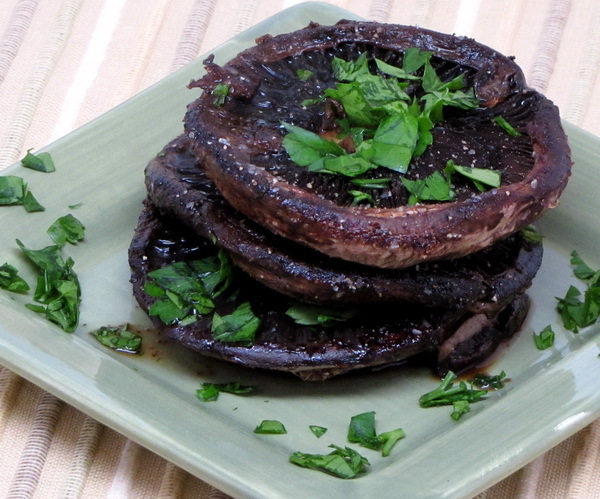 In a medium bowl, toss the mushrooms in the remaining 2 tablespoons olive oil. Season with salt. Place them, stem-side up, on the hottest part of the grill. Cook for 3 to 4 minutes, you may see liquid starting to emerge from the stem area. Flip to the other side and cook for an additional 3 to 4 minutes. Transfer them to a tray and place in the center of the oven. Cook until they are tender when pierced with the tip of a knife, an additional 12 to 15 minutes. Season them lightly with salt.